Genesee Community College welcomed 15 local law enforcement workers to the Batavia campus for a Death Scenes and Recovery of Bodies Seminar on June 1, 2 and 3. Sponsored by Genesee Community College and the Genesee County Sherriff’s Office, the seminar included police officers, investigators and coroner’s office staff from Genesee, Wyoming, Orleans, Livingston, Monroe, Niagara and Duchess Counties. Genesee Community College welcomed 15 local law enforcement workers to the Batavia campus for a Death Scenes and Recovery of Bodies Seminar on June 1, 2 and 3. Sponsored by Genesee Community College and the Genesee County Sherriff’s Office, the seminar included police officers, investigators and coroner’s office staff from Genesee, Wyoming, Orleans, Livingston, Monroe, Niagara and Duchess Counties. Two student volunteers from Genesee and St John Fisher College also assisted in the seminar. The seminar was lead by forensic anthropologist and Genesee adjunct instructor Dr. Jennifer Prutsman-Pfeiffer. In most jurisdictions, a death scene is the responsibility of the law enforcement agency, while the body of the decedent falls under the control of the coroner or medical examiner’s office. To ensure that investigations move in an appropriate course with efficiency, investigators from the representative agencies should be versed in each other’s objectives. The seminar centered on bringing those agencies together to learn the key components of forensic anthropology. The three-day seminar focused on the process, collection and analysis of remains in a forensic setting. The seminar was a mix of lecture and hands-on classroom participation, outdoor field exercises and site excavation. Participants gained an understanding of the scientific process of death investigation, from the recently dead to badly decomposed or skeletonized remains. Specialty training in the location and recovery of scattered surface and buried remains was practiced in outdoor field exercises. A portion of each day was dedicated to field exercises, including insect collection, grid search and recovery of surface remains, with the final day culminating with an excavation of a mock burial on the College’s west lawn, behind the new bleachers of the soccer/lacrosse field. 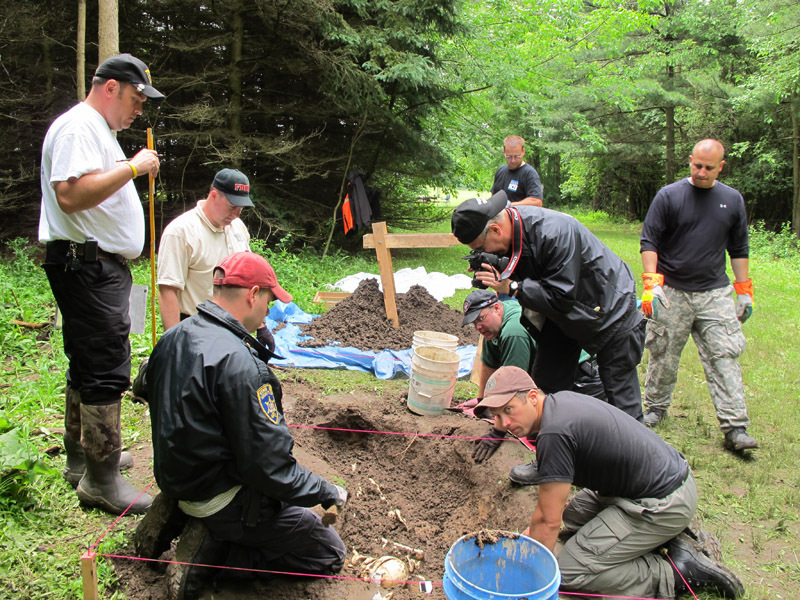 Ultimately, the seminar allowed local law enforcement personnel to enhance the quality and quantity of evidence recovery with practical applications of anthropology and archaeology integrated with crime scene investigation. 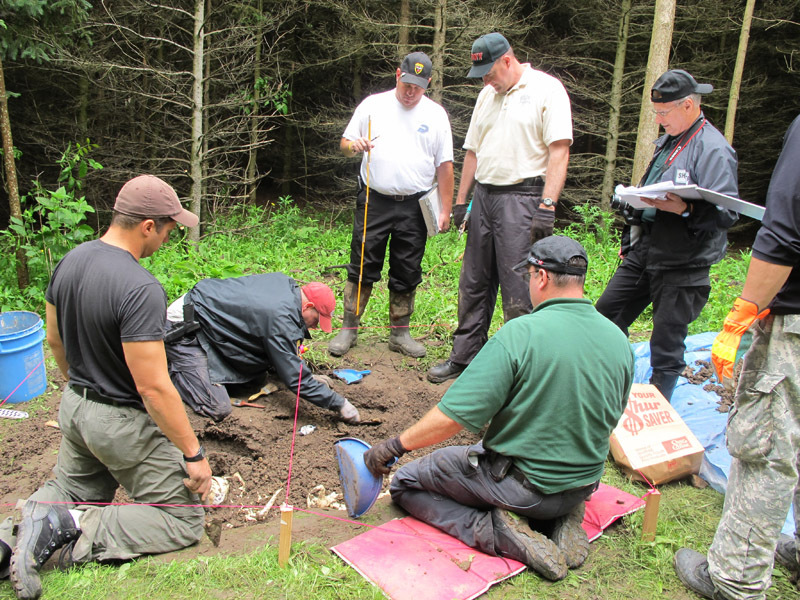 “Often, when badly decomposed or skeletonized remains are discovered, investigators frequently bring in an anthropologist’s expertise to assist in the recovery of remains and related evidence at the scene. Every aspect of death investigation and reporting may ultimately be put forth for closer examination in a court of law, so it is imperative we have cooperation of all the agencies involved,” Prutsman-Pfeiffer said. Dr. Jennifer J. Prutsman-Pfeiffer is a Board Certified Pathologists’ Assistant, Fellow of the American Association of Pathologists’ Assistants, member of the American Association of Physical Anthropologists and Fellow of the Physical Anthropology section of the American Academy of Forensic Sciences. Jennifer performs and teaches autopsies at Strong Memorial Hospital. As a Forensic Anthropologist, she has consulted throughout Western and Central New York, and was one of 33 anthropologists assisting in identifying victims after the World Trade Center collapse. Jennifer teaches forensic anthropology at Genesee Community College, the University of Rochester, St John Fisher College, and forensic science at SUNY Brockport. For more information please contact Dr. Jennifer Prutsman-Pfeiffer at 716-474-3483.